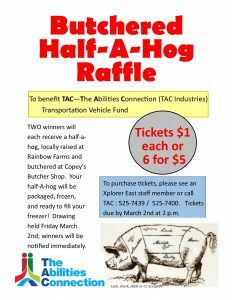 TAC is going whole hog to raise money for the transport of individuals with developmental disabilities. Two lucky winners will be drawn on Friday March 2, 2018 to win one half of a butchered, packaged, and freezer-ready hog. The hog was raised locally at Rainbow Farms and will be butchered to the winner’s specifications at Copey’s Butcher Shop. Raffle tickets to win half-a-hog are $1 per entry, $5 for 6 entries. “Proceeds from the raffle will go directly to our fundraising effort for 2018, the transportation fund,” said Lisa Good, TAC staff coordinator for the effort. Multi-passenger transportation vehicles are needed to transport people with disabilities to work, activities, and events. A local charity is on stand-by for anyone unable to use a half-a-hog. Winners may opt to donate all or part of their prize to The House of Prayer, which operates a food pantry for those in need.